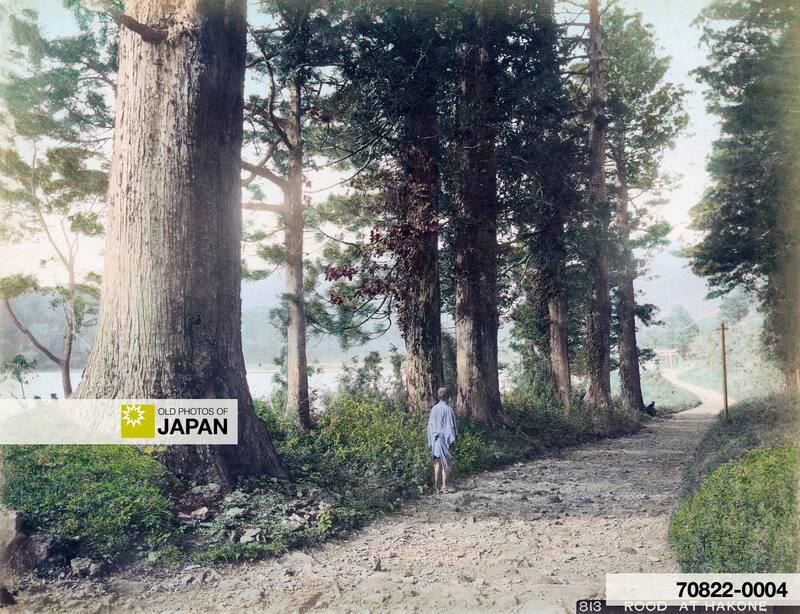 There is the famous Cryptomeria Road in Nikko as well. A man wearing a hanten (半纏, half-coat)—probably Kozaburo Tamamura’s guide or the carrier of his equipment—stands near the entrance of the cryptomeria road (杉並木) in Hakone, Kanagawa Prefecture. This is the old Hakone Highway (箱根旧街道) near the Ichinotorii gate (一の鳥居) at Moto-Hakone (元箱根)1. Although this was an important and well-traveled road, the road surface looks a bit painful to walk on with straw sandals. It certainly was a beautiful one, though. Through the majestic cedar trees, Lake Ashi (芦ノ湖) can be seen. Hakone used to be an important checkpoint on the Tokaido, the main highway connecting Edo (pre-1868-Tokyo) with Kyoto. It was the tenth of the fifty-three stations (宿, juku) of the Tokaido and established in 1618 (Genna 4). Hakone-juku was first established on the Edo side of the Hakone Checkpoint (箱根関所, Hakone Osekisho). But because inhabitants of that area refused to build a honjin (本陣, inn for government officials), it was moved to the Kyoto site. Settlers were forcibly moved there from Odawara (小田原) and Mishima (三島), both juku neighboring Hakone. From the top of [Mount] Hakone we had a fine view of the City and Bay of Suruga. Fusiyama was quite near, and altogether a different affair from the glorious view at Yugasima. A short distance on the north side of Hakone, and about one mile from the top, stands the village of that name. Here is the celebrated pass into the Yedo [Edo] district, and a rigid search is made of every norimon, and each person is examined as to his passport. Here the Vice-Governor of Shimoda, after a vast deal of circumlocution, informed me that, when the great Princes of the Empire passed here, the door of the norimon was opened and an officer looked into it, without stopping the bearers; that it was a mere ceremony, but the ancient laws required it, etc., etc. I replied that, as I was not a Japanese subject, and being as I was the diplomatic representative of the United States, I was free from any such search; that they knew what was in my norimon, and could inform the officers at the pass that there was nothing forbidden in it. The Vice-Governor tried for some time to change my determination, and at last proposed that I should ride through on horseback, and then permit the search of the empty norimon. I decidedly declined this, telling him that it was the search under any form that I objected to. He then said that we must stop until he could send to Yedo for instructions, which would only take five days. I told him I should not wait five days nor five hours; that if the search was insisted on I should at once return to Shimoda. The poor Vice-Governor was in great tribulation and finally went to the guard house, and after a delay of two hours returned with word that it was all settled and that I should pass unmolested. Established in 1619 (Genna 5), the Hakone Checkpoint was abolished in 1868 (Meiji 1). In 2007, a reconstruction of the Hakone Checkpoint was opened. It is very well-done and traditional architectural techniques were used. The site features gates, a guard house, an office, a lookout tower, a bulletin board, a shooting range, stables and a small museum. A telephone, telegraph or electric wire pole is visible in the back of the photograph. The Hakone post office first used telecommunications in July 1881 (Meiji 14)4, so this photo dates from after that period. If these are electric wires, it was taken after 1905 (Meiji 38)5. 1 Metadata database of Japanese old photographs in Bakumatsu-Meiji Period. The Hakone Road. 2 Griffis, William Elliot (1876). The Mikado’s Empire. Harper, 420-421. 3 Griffis, William Elliot (1876). The Mikado’s Empire. Harper, 128. 4 Metadata database of Japanese old photographs in Bakumatsu-Meiji Period. Old town by lake ashinoko. 5 Metadata database of Japanese old photographs in Bakumatsu-Meiji Period. Rows of cedars along a road. You can also licence this image online: 70822-0004 @ MeijiShowa.com. Acyually, this is not Nikko in Tochigi Prefecture, but Hakone in Kanagawa Prefecture. But it does look very similar and is just as scenic. I do have some beautiful photos of the Cryptomeria Road in Nikko, too. They should go live next year.